GORGEOUS Baby Birdie Sculpted by Laura Lee Eagles. 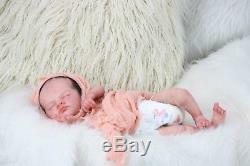 This beautiful little baby wears newborn size clothing. She has full arms and full legs. She weighs approximately 4 pounds 14 ounces and is 17 in length. This cutie patootie was signed by Laura Lee Eagles at the International Doll & Teddy Show in Orlando, Fl. She has been painted using Genesis Heat Set Paints which will not rub off or fade then finished with a subtle layer of matte varnish. I have used my own techniques, working in ultra fine layers to create a beautiful translucent coloring with subtle mottling and veining. Every single part of this baby has been given fine attention to detail; nothing has been overlooked, right down to the markings on her head. She has micro-rooted darkest brown mohair. Her eyelashes are rooted with matching mohair. She is realistically weighted using ultrafine glass granules, tiny pellets and top quality fiber. They are safe to travel worldwide. Her head is weighted with glass granules and fiber giving them the lovely, but subtle,'flop factor' that small babies do have and this will need supporting. They feel so incredibly real snuggled in your arms.... She has a superior doe suede body with cable ties made especially for her. She has a vinyl head with vinyl limbs. None of my photographs have been enhanced in any way. Some photographs may appear dull due to the overcast weather. I take my own pictures therefore they are not taken by a professional photographer. Other items shown in photographs not listed below are props or clothing, etc. This beautiful little baby will come home with a 2 piece outfit, 3 piece outfit, front belly plate, magnetic umbilical cord, magnetic pacifier, and a few extra goodies. I try to accurately represent each one though realistic pictures. Sorry no layaway or trades. The item "Baby Birdie by Laura Lee Eagles. 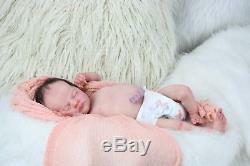 Beautiful Reborn Doll with COA signed by Laura" is in sale since Tuesday, August 21, 2018.